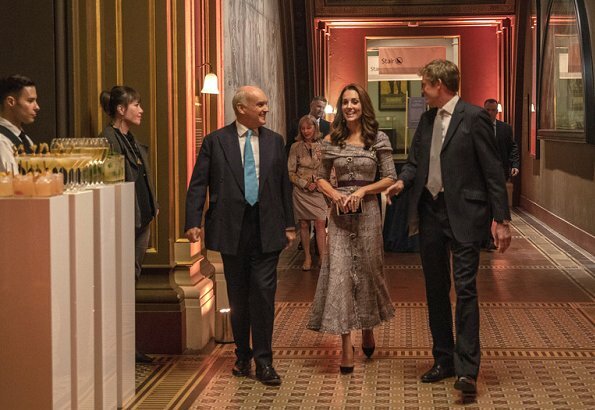 On October 10, the Duchess of Cambridge made her first visit as Royal Patron of the V&A to open the museum’s new Photography Centre. 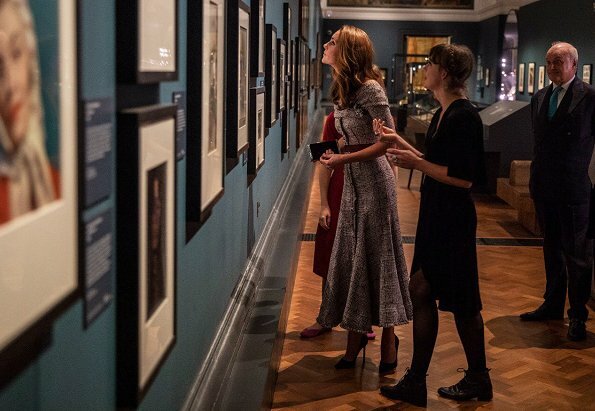 The Duchess toured the opening display called "Collecting Photography: From Daguerreotype to Digital" at the Photography Centre. The display showcases contemporary photography alongside seminal prints by pioneers William Henry Fox Talbot and Roger Fenton. During her tour of the exhibition, the Duchess met with curators who have worked on the Project and then, the Duchess unveiled a plaque to mark the official opening of the Centre. This is perfect - classy and elegant. This time she didn´t look like a pure color. Classic with some artsy twist. Wow! I really like Kate's style here. Traditional tweed in modern and trendy way.She looks as young as she is with this outfit. While I am NOT a fan of ERDEM, with this dress I have to give him credit. It is exquisite and even more so on Kate. Same for me.. I love it; just, if I dare, a bit too long. I prefer the length on the modell. Love the entire look including the added belt. This is reminiscent of pre and just post wedding Kate. Her hair looks fantastic, too. Both the dress and the wearer are a perfect match. They both look stunning! This is just lovely--playful and elegant, and it fits like a glove. 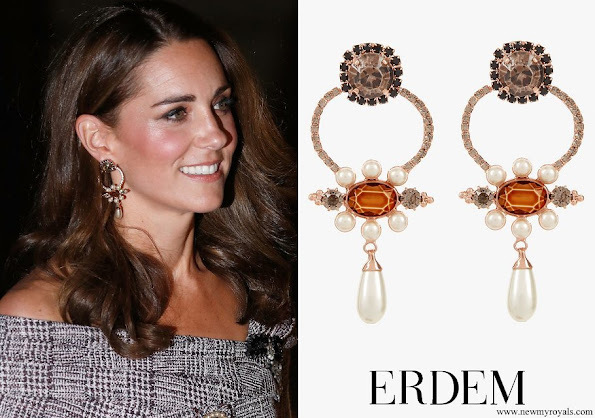 The earrings, which are also Erdem, are beautiful. I love the addition pf the belt and the matching shoes and clutch. She looked beautiful and very confident. I am reconciled with Erdem after that floral gold mess of earlier this year. I absolutely agree. Beautiful look. I LOVE LOVE LOVE this dress, especially on the DoC. 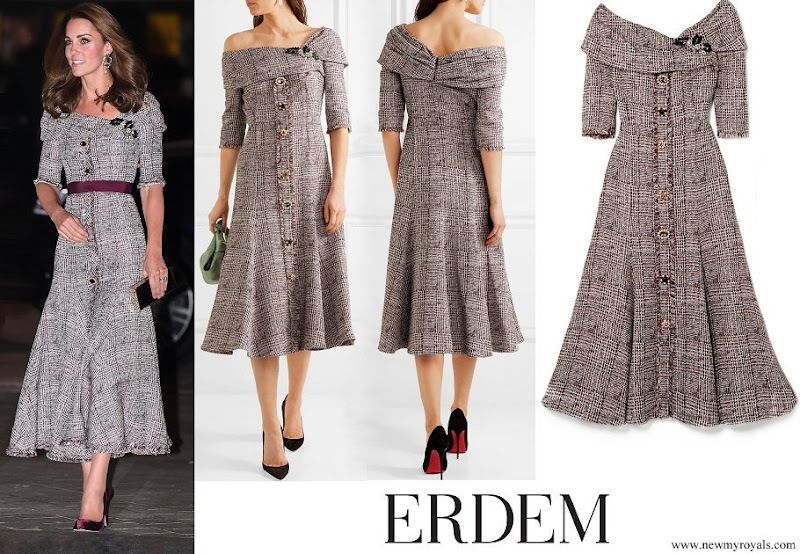 Normally, I find Erdem too frou frou, but this tweed with the midi length and silhouette...I wish I had this in my closet. I love the belt Kate added and those velvet shoes. I'm so happy to have Kate back on the scene. This dress is amazing-it looks great on her and she looks fantastic in it. The belt, shoes and bag are all spot on. Annie M., I agree as for Kate and as for Eugenie! Perfection! She has finally found a stylist that knows how how to color and style her hair to perfection. The Duchess looks better then ever! I would even add that she looks younger then when she was first married. Hopefully the frumpy days are behind her! 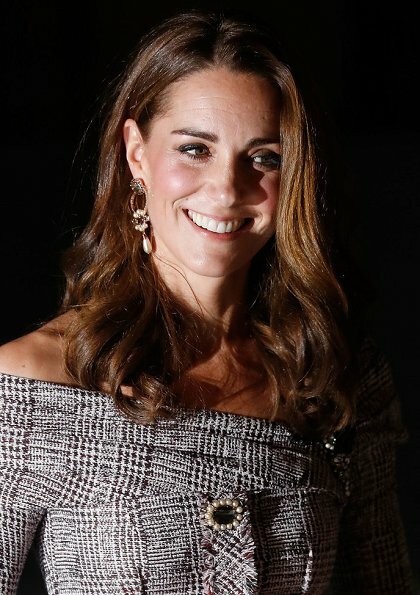 El vestido es perfecto para la figura de Kate, el detalle en el escote y la fluides de la falda, un vestido con acentos otoñales y coqueto. Los accesorios como el cinto y los zapatos le agregan un plus al look. 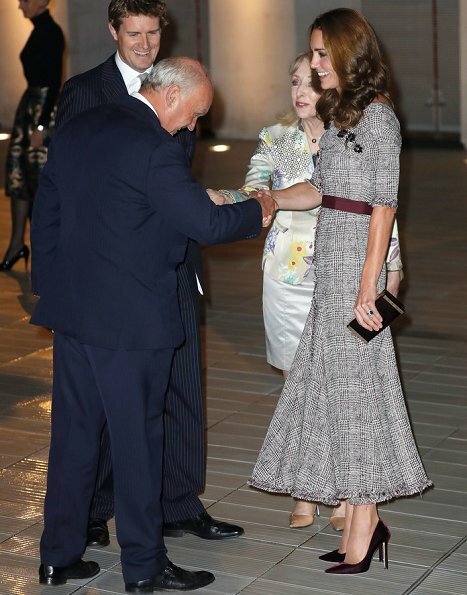 Absolutely adore this dress on Catherine, whose figure is ideal for it -- but I'd have preferred it without the belt. I agree. It's nice but would be even better without the belt. This is a fantastic dress,the winter fabric with short sleeves and off the shoulder it's just so original. Love every accessory as well, purse, brooch & earrings. A 10 for Kate today!! The first Erdem dress I really like. She looks amazing. This is fantastic. She had changes made to the bodice and added some length which is perfect. The addition of the belt is just the right touch. I would say that with the embellishments to the dress, I don't think she needed the statement earrings. I would have preferred something more simple, but I love the earrings on their own. wow those earrings are wonderful! Great from head to toe! Superb! I love the dress. I am not sure about the belt. Très jolie robe, mais sans la ceinture. Je pensais qu' Erdem ne savait faire que de moches robes toujours trop fleurie. Wow, feminine, modern, classy. Perfect. prachtig met dit kleede en ze wordt geen gram dikker ondanks drie kinderen. Pas d’accord. 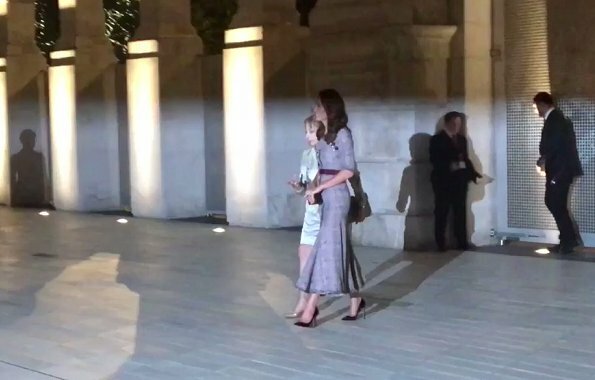 Kate has worn that bateau neckline several times before. A truly beautiful woman who has found her style today. Stunning, modern, classy! A dress Meghan also would wear. Very nice dress, not keen on the Neckline, but Catherine wears it like a pro. Love the Jewelry are these earrings new?, very well put together. And BTW her figure is super after 3 children. Well... The best Erdem dress so far (after two the most horrible maternity dresses). It looks better on Kate than on the model. Well done.